If you’re looking for a recipe to use up some ham in your freezer that’s left over from a holiday meal, then this Ham and Potatoes with Baked Eggs skillet should do the trick. 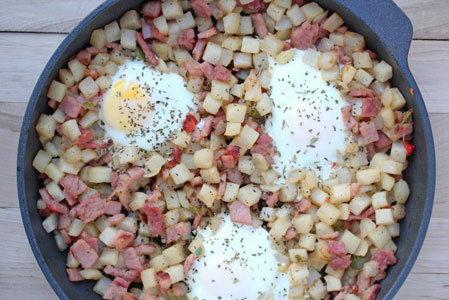 Dump potatoes and ham into skillet. Toss the potatoes and ham. Holler at kids to get shoes on. And to pack their backpacks. Put the whole skillet into the oven. Make sure everyone is presentable and that shoes are on the right feet. Cut up fresh fruit. Put final touches on lunches. Serve warm, filling, hearty and wholesome breakfast. Give hugs and kisses and send everyone off to work and school. Hope you enjoy this delicious & hearty breakfast, or brinner! Add the oil, potatoes and ham to the skillet and saute for 7 to 9 minutes. Then make a few wells for the eggs. Crack the eggs into each well. Then put the skillet right into the hot oven. Serve Ham and Potatoes Saute with Baked Eggs and a side of fresh fruit. Your Ham and Potatoes with Eggs looks delicious! I also used sale potatoes in my dish: Hashbrown and Bacon Frittata. Wait, you can freeze potatoes? I can never get potatoes to keep from spoiling. Is there anything special you have to do? Can you use them in any recipe after they are frozen, or do they change somehow, and you can only use them in certain ways? Love this picture! I think this one pan meal will be on my table this Saturday morning.